Oriental Medicine (OM) pre-dates modern western medicine by several thousand years. It has grown and developed into a comprehensive health care system with a continuous history of over 2,300 years. Today Oriental medicine is widespread and has touched every part of the world. Oriental medicine is the result of generation after generation of doctors and scholars observing both the principles of the natural law of nature, and the different phases of life’s natural cycles: Change, Growth, Balance, and Harmony. Temperature and climate changes such as heat, cold, dampness and dryness were also studied, as well as their affects on both nature and man. The mind and body share a very powerful connection, even today with all the technologies we have, scientists tell us we only use a very small percentage of our brain. Oriental Medicine has been observing the symbiotic connection between our minds and our emotions for over 2,300 years. Promotes health and well being for both mental and physical conditions simultaneously. Its immediate effects include a sense of well-being and relaxation, as well as reduced anxiety and depression. Treats multiple illnesses based on generations of clinical experience. Serves as a general balancing treatment, treating not only symptoms, but also the root cause of those symptoms. QiGong – Breathing and stretching exercises which increase oxygen and blood flow to the body as well as to help increase range of motion to the joints. Cupping, an ancient method of healing, involves suctioning the skin, muscle, fascia, and blood vessels on specific meridians or affected regions of the body. This technique traces back to the early fourth century when hollowed out animal horns were placed on certain areas of the body to initiate the healing process. Watch this video of a cupping session, recorded live for DelawareOnline! Energy flows through passages in the body known as meridians, which can become blocked. During an acupressure procedure, pressure is applied to points along the meridians to clear the blockages. Acupressure uses the same points and meridians throughout the body as acupuncture, but instead of using needles, a therapist applies a gentle to firm finger pressure. When these points are stimulated, they stimulate the body’s natural self-curative abilities, release muscular tension and promote healthy circulation of blood. Acupressure has been effective at helping manage nausea and vomiting, helping lower back pain, tension headaches, stomach ache, and many other ailments. Dry needling is a technique used to relieve pain or improve the range of motion of muscles. The procedure relieves muscular tension and spasm often associated with arthritis, nerve irritation, muscular strain, ligament strains, and herniated disks. A dry needle, without medication or injections, is inserted through the skin and into areas of the muscle known as trigger points. Dry needling can be used to target trigger points that are not otherwise manually palpable. I was nervous going in for acupuncture but the staffs kindness and Dr Briggs sense of humor helped me get over that- I am actually looking forward to my next visit! I was suffering daily with anxiety, to the point that I didn’t want to leave my house. My life has changed overnight since my first acupuncture treatment. I’m not only sleeping through the night, but my life is enjoyable again. Since starting acupuncture, I no longer have panic attacks or anxiety! I was experiencing dizzy spells, headaches and eye twitching for 6 months. After 12 sessions (6 weeks) of acupuncture, my eye has stopped twitching, my headaches are less frequent and the dizziness has decreased! Immediately after having ear surgery, I experienced severe vertigo whenever I walked or moved my head. Daily living activities were non-existent—I was unable to work, and needed help bathing, dressing and doing light housekeeping. After just one acupuncture session I felt 50% better. After three sessions, my symptoms were totally gone! I had no idea what to expect as this was my first Acupuncture experience. Dr. Farrell is great and I’m feeling better and in control not to mention my back pain is better. Acupuncture is one of the modalities of Oriental medicine. Acupuncture consists of the insertion of extremely fine, sterile, stainless steel needles into certain locations on the body at specific points shown to be effective in the treatment of specific health problems. These points have been mapped by the Oriental medicine doctors for over 2,300 years, and there are more than 1,000 known acupuncture points. In the past three decades electromagnetic research has confirmed the existence and location of these points. The points are like switches on a circuit breaker for regulating and balancing the body. Modern Western medicine cannot yet explain how acupuncture works. Modern Western medicine cannot yet explain how acupuncture works. Acupuncture is based on ancient theories of the flow of qi (a fine, essential substance which nourishes and constructs the body) through distinct channels that cover the body somewhat like nerves and blood vessels. According to this theory, acupuncture adjusts the flow of qi in the body, leading it to areas where it is insufficient and draining it from areas where it is stuck and / or superabundant. In this way, acupuncture restores the harmonious balance of the body and its parts. In Chinese, there is a saying, “if there is pain, there is no free flow: if there is free flow, there is no pain.” Acupuncture promotes and reestablishes the free flow of qi. 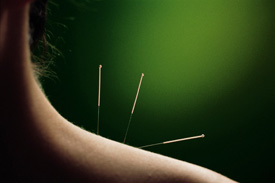 Acupuncture needles are typically not much thicker than a hair, and their insertion is practically painless. It is nothing like receiving an ordinary injection. In some cases, you will not even know the needles are in place. In others, there may be some tingling, warmth, heaviness, or a feeling of the qi moving up and down the channels. Most people find acupuncture extremely relaxing, and many fall asleep during treatment. Chinese Herbal Medicine is the main modality or treatment method within OM. It has been practiced in the Peoples Republic of China thousands of years. Although acupuncture was the first Oriental modality to gain wide acceptance in the West, Chinese herbal medicine is rapidly establishing itself as one of the most popular and effective alternative therapies in the West. Can herbal medicine be used at the same time as Western Medicine? Research in China suggests that the combination of Chinese and Western medicine for a health condition is better and more effective than either one is alone. When one combines Chinese and Western medicines one gets all the power and speed of the Western drugs while typically requiring a lower dose and fewer different medications. In addition, the Chinese medicine is commonly able to eliminate any side effects of the Western medications. Side effects come from forcing one part of the body to behave while causing an imbalance in some other part. What is Oriental Medicine good for? Oriental medicine treats the full range of human disease. It treats acute diseases, like intestinal flu and the common cold, as well as chronic diseases, such as allergies, gynecological disorders, auto-immune diseases, chronic viral diseases, and degenerative diseases associated with aging. In particular, Chinese herbal medicine excels at promoting the body’s ability to heal and recuperate. Over the last several years many hospitals and universities across the country have been doing studies on the positive effects of acupuncture. Many of these hospitals have also created integrated healing centers inside the hospital setting, so that patients can receive conventional medicine and Oriental Medicine in one place. The integration of the two medicines has opened the doors for patient’s to receive the best of both worlds. Included among the hospitals that have integrated Oriental Medicine include; Duke Medical University, Thomas Jefferson Hospital, and Johns Hopkins Medical Center. Acupuncture and Oriental Medicine is recognized by the National Institute of Health (NIH), Complementary and Alternative Medicine (CAM) and the World Health Organization (WHO) to be effective in the treatment for over 40 common disorders. What problems can be treated by Oriental Medicine? In addition, Oriental Medicine has been used for centuries throughout Asia to treat hundreds of other problems. When performed by a competently trained, licensed professional, Acupuncture and Chinese Herbal medicine is extremely safe. 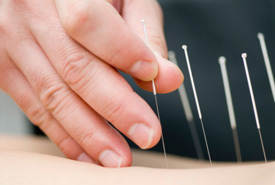 All licensed acupuncturists today use individually packaged, sterile, disposable needles. That way, there is virtually no chance of infection or contagion. Caution: The improper use of Chinese Herbal Medicine can be dangerous. Please consult with a licensed acupuncturist before taking any herbal products. The answer depends on the duration, severity, and nature of your complaint. You may need only a single treatment for an acute condition. A series of 6-24 treatments may resolve many chronic problems. Some degenerative conditions may require many treatments over time. To help reduce the number of treatments, your practitioner may suggest herbal medicine to help increase the efficacy of the acupuncture treatment. In acute conditions, results with herbal medicine can be expected in a matter of minutes. In chronic conditions, some results should be seen within two weeks. Although chronic conditions may require taking Chinese herbal medicine for a long time, signs that the medicine is working should be apparent to the patient and practitioner almost from the very start. Is there anything I need to do before receiving an acupuncture treatment? Relax; there is no need to be frightened. Ask your practitioner any questions you have along the way so that you can get the most benefit possible from the treatment. Although called Chinese herbal medicine, OM practitioners use ingredients from all three kingdoms: vegetable, animal, and mineral. However, the majority are from vegetable sources. Leaves, flowers, twigs, stems, roots, tubers, rhizomes, and barks are some of the vegetable parts used. Can pregnant women take Chinese herbs? Yes, if prescribed by a professional OM practitioner. Chinese herbal medicine has been used for more than 2,300 years to treat many of the symptoms occurring during pregnancy without harm to the fetus. Likewise, lactating mothers can take Chinese herbal medicine safely as long as they are prescribed by a trained practitioner. Can children take Chinese herbal medicine? Yes. Pediatrics is a specialty within OM, and children are given smaller doses. There are also specially prepared pediatric medicines in pill, powder and liquid form. Chinese herbal medicine can treat colic, the fussiness of teething, ear aches, diarrhea, cough, and fever in babies and children. Does Chinese herbal medicine have side effects? There can be side effects from anything, however if the formula has been correctly chosen and properly applied by a trained Oriental Medicine practitioner, according to a correct Oriental Medicine pattern diagnosis, there should be no negative side effects, only beneficial healing results. If a patient experiences any discomfort while taking Chinese herbs, they should tell their practitioner immediately. The practitioner will then modify their formula accordingly. Most of the medicinals in the Chinese material medica have a very low toxicity compared to common, over the counter Western drugs. Ready to get started?  Contact one of our seven Delaware locations and schedule an appointment today!